Banner stands are one of the most integral pieces of marketing equipment that a business can own; they are versatile, budget-friendly, effective and simple, and they tick off a lot of promotional boxes. They can be used in hallways to emphasise branding within a business, they can promote a sale or a discount at a special event, or they can form part of an exhibition display at a trade fair. It is little wonder, then, that there are so many different types on the market, all of them boasting different construction, materials and varying benefits. This handy guide outlines the most popular types of banner stands for exhibitions, events and in workplaces today, with their particular benefits and advantages for businesses. Lightweight and easy to assemble, roller banner stands are the most popular type of exhibition stand for trade fairs and other special events. The banner itself is stored within the base of the stand, and can be rolled up and attached to a tensioned rod which keeps the banner upright. The mechanisms within are lightweight and reliable, and will often last for many exhibition seasons, provided the stands are transported around in the carry bags they are often supplied with. These stands are great all-rounders and are perfect both for small businesses on their first exhibition trail, and for experienced sales teams presenting at some of the world’s biggest expos. 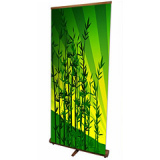 Growing in popularity as companies turn more towards ‘green’ processes and suppliers, bamboo banner stands come in a range of different styles and can be adapted to suit most needs. From the tensioned bamboo banner stand to the roll-up stand, all bamboo stands provide a hardwearing and authentic looking stand which showcases graphics to their best potential. Companies with a specialist interest in environmental issues, Fairtrade systems or organic products would do well to be seen with a bamboo banner stand, paired with a graphic printed onto a natural textile. For a look which is slightly more contemporary and forward-thinking, many companies opt for ‘twist’ banner stands, which can be adapted to make interesting shapes and walls using flexible joining panels. The range of extensions and arms available mean that these stands are fully customisable and can ensure that no two displays ever look the same. A complete exhibition system can be assembled using just these ‘twist’ stands, making them a one-stop-shop for many businesses looking for a last-minute display.